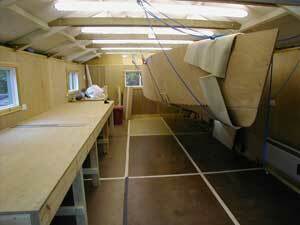 Time to re-arrange the workshop and bring the boat down to a more convenient working height. First raise the boat up with a pair of ratchet straps and remove the support frames. Then slide the bench over. 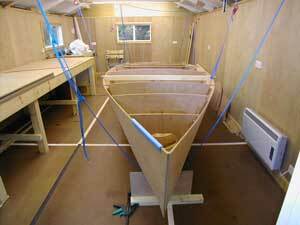 Then drop the boat down using a rope and pulley system, stem and stern, with the ratchet straps acting as safety stops.